As per the comments on yesterday’s item about creating a video crawl for local TV, it turns out there’s no need to produce a video file. Instead it’ll be OK to use a computer display directly. The computer could be running, for example, a PowerPoint slideshow in a loop. In a PowerPoint presentation, create a new slide for credits or any other list that you want to scroll from bottom to top. Type your credits or other text. Don’t worry about text running off the bottom of the slide. 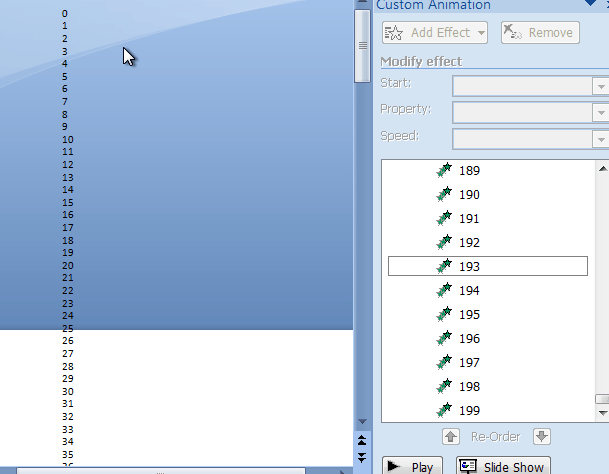 In fact, it should run off the bottom if you are going to have enough text to make a crawl effect work well. Right-click the text, and on the shortcut menu, click Custom Animation. Select the text that you want to scroll. 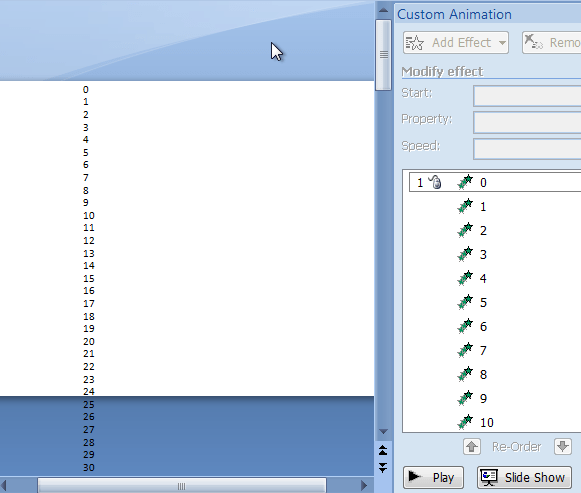 In the Custom Animation task pane, click Add Effect. Point to Entrance, and click Credits. Click Play to see how the effect will look on-screen. Move the text block completely off the top of the slide. When you play your presentation, the text will crawl or scroll from the bottom of the screen and disappear off the top. But it doesn’t look like you can get more than three screenfuls of data into the crawl. For example, I made a textbox with 200 lines of text numbered accordingly. Then I animated it using several varations on this technique. The effect: Line 0 crawls into view from the bottom of an empty slide, and the crawl ends with line 25 at the top and line 50 at the bottom. The effect: Line 0 appears at the top of the slide, the crawl ends with line 50 at the top and line 75 and the bottom. Is there a way to include more than three screenfuls of data in the crawl? If not, it looks like it’d be necessary to create a series of slides, each with two screenfuls of data. The first slide would need to have its first line of data at its top. But the second and following slides would need to have their middle lines of data at their tops. Gnarly. I’m sure that could be done, but why bother? Absent a requirement to produce a video file, there a zillion ways to make text crawl up a computer screen. This might be a good opportunity to explore the combination of IronPython and XAML. Author Jon UdellPosted on 26 Jun 2008 26 Jun 2008 Categories . I was wondering, what about HTML+TIME? Since it’s HTML-based, it should be fairly easy to use an XSL transform to morph your data from wherever you get it into HTML+TIME. At time t+1 element 1 is in class “shown” at 80%, element 2 in “shown” at 90%. I’m not the world’s foremost authority, as they say, but it seems do-able. You might look at Impress from OpenOffice.org. I think it’s free of this limitation.